MuzikMan's Reviews And News: Classic Rock Icons BLUES IMAGE Featuring MIKE PINERA Prove That The Best Songs Are TIMELESS! Los Angeles, CA - In 1970, Tampa-based rockers Blues Image took audiences on the trip of a lifetime with their smash hit single “Ride Captain Ride” - a song that continues to embed itself in pop culture consciousness, showing up as recently as 2004 in the hilarious Will Ferrell comedy Anchorman: The Legend Of Ron Burgundy. 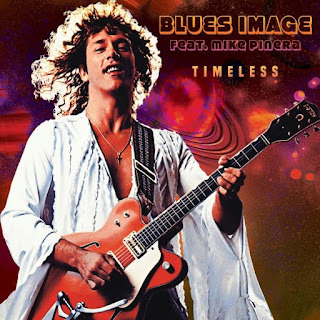 Vocalist/guitarist Mike Pinera founded Blues Image in the late ‘60s and quickly turned the band into a powerhouse collective with a reputation for stunning musicianship and, of course, exquisite songwriting. Pinera left the group briefly to front the mighty Iron Butterfly, but he’s kept the Blues Image fire burning bright for over 5 decades! Now, a remarkable new collection, Timeless, that honors the songs of the past as well as brand new material will be released on CD this March 31 courtesy of Purple Pyramid Records.